Brick Town Talk: Revisiting a Classic - LEGO Town, Architecture, Building Tips, Inspiration Ideas, and more! The American West - (BTT) For those of you with a strong feeling of déjà vu, you have good reason - marshal banana's masterwork above has been featured on the site before. 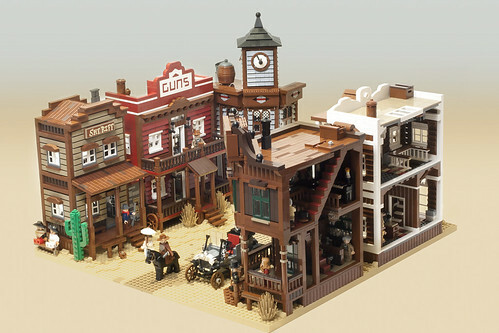 Not one to be left out on a worthy cause, I am pleased to join several other LEGO blogs in supporting this build on CUUSOO. At the time of writing, there are currently 2,600 supporters - more than a quarter way to the 10,000 needed to get the attention of LEGO with the hopes of seeing production. If you like what you see (and if you don't, what's wrong with you?) please click here and join the movement!